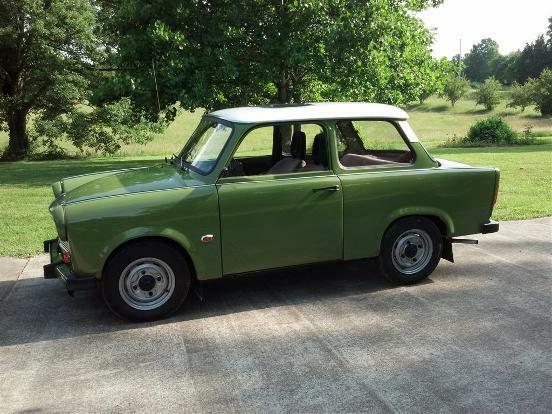 Sooo...What is a Trabant? Well, here is a picture of one. Personally, I think it is adorable...and I really want to have one. Been watching some YT videos about these lately. The more I see them, the more I want one....just to say I have a Trabi. I think it is called "Duroplast" or something like that. Anyways, that would be great up here in the Rust Belt of the US. The body would stay rust free! Evidently they're kinda hard to get outside of Eastern Europe- though if you wanted to order one from a country like Estonia or the Ukraine I can't imagine the car itself would cost too much. International shipping might be pricey though. Found a website on the subject too if you're interested. The home for Trabants in the US and Canada!